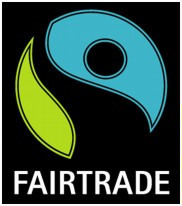 The Fair Trade Foundation is one of several organisations actively supporting a fair & equitable system of World trade. They bring first class commodities to thinking people, at a competitive price, whilst simultaneously allowing a fair income to growers & workers. If you would rather find out the details from their site, their logo will take you there. The Co-operative movement supports fair trade, as do a number of other supermarkets and some independent stores. There is however a problem, Speaking to staff at our local Co-op showed a disturbing fact. When they stock 'Fairtrade' goods they have difficulty selling them. They can only get rid of them by special offers & discounts. Customers won't buy them because they are expensive! Come on now everyone, are we a cheap & nasty discount mad society? FAIRTRADE goods may cost a little more than supermarket's own brands, they are often cheaper than big name brands. For an average shopping basket full, FAIRTRADE shopping costs the price of a can of beans more than the cheapest. For that you get fresher, better tasting, organically grown goods, rather than intensively farmed produce laced with chemical fertilisers & pesticides. Plus you help keep thousands of hard working people, just like you, out of abject poverty. People of this country have rallied together & raised far more money than our government, for the poverty stricken tsunami victims. After showing such generosity, why can't we do ourselves a bit of good? Spend a few bob more per week, to keep some of those people out of poverty in the first place. Healthier eating and feeling good. As an example, FAIRTRADE bananas taste good, they are grown as nature intended, without chemicals, arriving fresh & ripe. Industrially produced bananas are picked early, whilst still green. On the way over, ship's holds are pumped full of a gas, to make the skins turn yellow during the voyage. This is all done to make them last artificially, they look ripe, but really they are not. It was a revelation when we found this out, now we know what to look for. Cancer is a steadily growing problem in our society, much, probably most, of it is man made. Eating food with less chemicals can only help. McSpotlight, a page from London Greenpeace's interesting site. I for one used to shop at the stores spotlighted, thinking that by buying their more expensive products, I was helping indigenous peoples. Getting a bit suspicious, I stopped. Now I know. These are people who care enough to do something about it. Willing to stand up to global corporations, suffering in the process. We all owe them a debt of gratitude. Battery Vs. Free Range Eggs. Not directly related to Fair Trade, but certainly related to our humanity and of course our health. Again our Co-op only stock a small number of free range eggs, usually only in boxes of six. We enquired why, a similar answer, they cost more, fewer people buy them. We will not buy any other kind, sometimes we have to hunt for them. Most of us are caring people, we kick up a fuss about any kind of deliberate cruelty. Why have we forgotten about the poor hens? Innocent, harmless birds, jammed in a cage, unable to move, laying eggs & eating. Nothing else. Fed on nutrients & drugs designed to produce the maximum egg yield. These chemicals finish up in the eggs & anyone eating them. Things are even worse for chickens raised for food in factory farms. They are selectively bred for maximum weight, then fed drugs to promote rapid growth. They are confined in overcrowded conditions, so they can't open their wings or move about. Conditions are filthy, to stop the spread of disease they are given constant doses of antibiotics. They are killed when still babies, at a month & a bit. Their natural lifespan is 10 to 15 years. So if we eat such chickens, not only are we supporting almost unbelievable cruelty, we are dicing with our own health. Growth hormones & drugs have unexpected results when fed to humans. Often causing disproportionate growth of certain parts of the body, similar to the results of cancer. Antibiotics when ingested, can cause immunity to the effect of similar medication prescribed for human diseases. Similar in some ways to the effect of AIDS. Recent pandemics of avian diseases among humans have highlighted the danger to us of our own cruelty. Some consider it a kind of divine retribution. One thing is certain, we have brought it upon ourselves. Links, to other sites covering similar issues. Not for ostriches. This text links to one of many sites covering the issues raised. This page, on PETA's site, is far more targeted, not to be seen if the content offends you, or before eating chicken. It seems you now know where to shop, if you fancy fast food full of growth hormones & drugs. Not suitable for viewing by children. This video recording, by Pamala Anderson, shows some of the startling level of cruelty inflicted on chickens. Hosted on PETA's site, it is upsetting as well as informative. Not suitable for viewing by children. This PETA page is more suitable for young people. You may find this PETA item, on the nature of chickens, interesting. Don't just take my word for it on the issue of antibiotic immunity. I have found this item showing the serious nature of the problem. Relating to animal feed additives. Another site highlighting the problem in some detail. This site covers the matter of growth homones, this time in dairy cows. It should be read carefully, cancer is one of our major killers, many causes are man-made. A site covering Growth Hormone issues & dangers. Further pages on loss of family farms & Mad Cow Disease (vCJD & CJD) can be reached. Interesting if you are not an ostrich. More problems with Growth Hormones. The following three (slow loading) sites are specifically American, the issues raised affect us all. Growth Hormones in our food. Some health & other issues. Growth Hormones in our food, how to eat less of them. Mad Cow Disease (BSE, vCJD & CJD). How to reduce the dangers. An excellent presentation highlighting issues relating to factory farming. Human health, animal cruelty & community destruction etc. Requires Flash (TM) Player & sound. Farm, an organisation campaigning to protect British farmers & U.K. customers. Fair Trade. Updated on the 27th of July 2007. © Ron Lebar, Author.